You can tell a lot about a person when you look at how well they groom themselves. If a man has a nicely groomed beard, styled hair, pressed pants, and polished shoes, it is likely that he is a person who takes pride not only in how he looks but also in what he does. One of the most important facets of grooming is keeping your fingernails trimmed. It’s a meticulous process, but it definitely goes a long way in affecting how put together a person looks. In order to get a nice manicured look, you need to have a good pair of fingernail clippers. A good pair of fingernail clippers can cut through the toughest toe and fingernails without leaving a jagged edge behind. We’re going to look at four different fingernail clippers. Three of them are ranked gold, silver, and bronze. Finally, we will throw in one budget option that gets the job done for less money. Seki Edge is a Japanese company that has a reputation for making products that have an unmatched level of quality and durability. The Seki Edge Stainless Steel Fingernail Clipper more than exemplifies the attention to detail that this company has become famous for. Their fingernail clippers are made from stainless steel. The benefits of using stainless steel for this type of product are numerous and include the fact that stainless steel will not rust and will keep its sharp edge. And as anyone who has had the misfortune of trying to cut their fingernails with dull fingernail clippers knows, the sharper the edge, the better the product. After the initial manufacturing process, the Seki Edge Stainless Steel Fingernail Clipper is finished by hand. It is this attention to detail and craftsmanship that sets this product apart from all of the other fingernail clippers you will find either in stores or online. Keeping your hands well manicured should not be a difficult task. It should not be something that requires a lot of effort or that forces you to use your muscles in an awkward or uncomfortable way. For this reason, this Seki Edge Stainless Steel Fingernail Clipper have been designed to be ergonomically sound. They have a very smooth action and require little to no effort to use them properly. When you are trying to clip your fingernails into a particular shape, you need fingernail clippers that are precise. You need fingernail clippers that are able to clip all the way through your fingernails in one shot and that won’t leave you with a little sliver of nail hanging off your finger that could later get caught in clothing and on furniture and cause you some serious pain. With this Seki Edge Stainless Steel Fingernail Clipper, shaping your fingernails and cutting them to the desired length with one snip is not a problem. They are designed to cut in a decisive way, using decisive strokes. This should not be surprising since the same mountain area where this tool is designed is also the part of the world that was known for making some of the sharpest, well-balanced, most attractive samurai swords on the planet for centuries. Seki Edge Stainless Steel Fingernail Clipper prides themselves on their adherence to the Bushido approach when it comes to making their products. This means that in harmony with the samurai code, they create their products with honor and discipline. They refuse to accept anything less than perfection when it comes to the products they create. For this reason, all of their personal grooming tools are among some of the most sought after in the world. Seki Edge Stainless Steel Fingernail Clipper uses a mixture of old-world skill and modern technology to produce products that reflect timeless craftsmanship. It is easy to see that the products they create are designed to last the user for many years, if not for the rest of their life. Thanks to the product’s finished cutting edge, easy action, stylish yet ergonomic design, and durable twice tempered stainless steel, these clippers have developed quite a positive reputation on Amazon.com. More than 1,000 individuals who reviewed this product gave it a perfect score of 5.0. Another reviewer said that they never thought they would write a review on fingernail clippers. They go on to tell how over the years they have owned many of them, but it was not until they use the Seki product that they realized how difficult the old style of fingernail clippers was to use. They commented how with their old fingernail clippers they would end up squeezing their nail and cutting it off, but would be left with a rough edge. However, with this new model, they feel like it’s almost as if they are cutting through butter with a hot knife. While this product is particularly designed to be used on your fingernails, many individuals who used it to cut their toenails had no problem with it. From what we have seen, this is hands-down the best product of this type that is available on the market. It may be a touch more expensive than what you are used to paying for fingernail clippers, but when you see the results you get, we are sure that you will agree that it is more than worth the money. We were really excited when we decided to put the No-mes Nail Clipper with Catcher in our top four picks of the best fingernail clippers. Right off the bat, you are going to notice that this product has a very unique design. It is definitely not like other clippers that you can buy in local drugstores or even ones that you may see used in a salon. 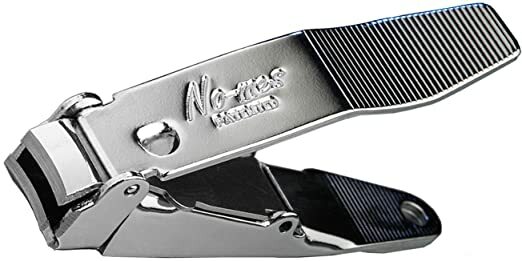 One of the most beneficial things about the unique patented design of the No-mes Nail Clipper with Catcher is that it catches fingernail clippings very easily. Once you are done trimming your fingernails, you can easily and quickly open the handle in order to empty out all of the contents. You will not have to sweep up the floor or do any other cleaning in order to get rid of all the trimmings. You can just dump everything into a wastebasket. This is something that is especially useful in professional settings. It’s easy to keep your workspace clean, and there is very little to do when your next customer comes to get a manicure. Something else that we really liked about this product is that it has an unconditional guarantee for life. When a company is willing to guarantee the product they make for life, they are proud to stand behind it. They know that it is something that is of high quality and will do the job it is designed to do, not just now, but for the rest of its lifespan. Even though it is a small tool, it definitely is powerful. It has been manufactured using heat-treated tool steel. The edges are precision ground, making sure that you get a smooth, precise cut every time you use the product. It is made in the United States. We were really impressed with what real users have had to say about this product. When we looked on Amazon, we saw that 124 individuals have reviewed the No-mes Nail Clipper with Catcher. Over 75 percent gave it a perfect score. Overall, it has a 4.5 out of five-star rating. One individual who reviewed the No-mes Nail Clipper with Catcher said that they could tell it was made by professional metal cutters. They absolutely loved the design. They say that the pictures do not do it justice. They say that the cutting edges are very sharp and it requires very little effort to use. They like the fact that the method of clipping retention was also outstanding and did not interfere with cutting or gripping the product. They say that they have had problems with other fingernail clippers in the past. Another individual said they were perfect and felt that they were more than worth the money they spent. We really feel that our silver product is worth the money to. Real users have said again and again that No-mes Nail Clipper with Catcher is a perfect choice, it is made well, and it is the best set of fingernail clippers they have ever used. This product is definitely worth taking a look at on your hunt for the perfect fingernail clippers out there. We have decided on the Tweezerman Stainless Steel Fingernail Clipper model as our bronze product. It offers a couple of nice features, but what you are going to like most about the product is that it has a simple design and will get the job done. 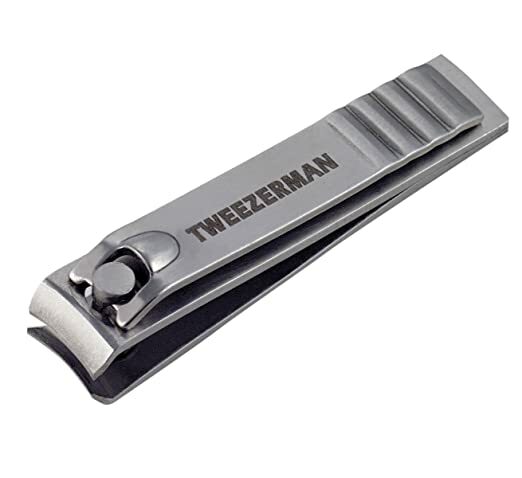 Because the Tweezerman Stainless Steel Fingernail Clipper is made from professional stainless steel, you are not going to worry about the product rusting. Once you purchase these inexpensive, but high-quality fingernail clippers, you will likely not have to purchase another pair for many years or perhaps never again. Besides the fact that they will not rust, the stainless steel delivers a strong and sharp cut every time they are used. Even though the Tweezerman Stainless Steel Fingernail Clipper will deliver a sharp and solid cut each time it is used, there are certain things that you can do to prepare your fingernails in order to get the best results. For example, you can soak your fingernails before trimming in order to soften the nails. Also, you want to be careful about where you cut, so as not to trim below the nail bed, which will lead to sensitive fingertips and perhaps even infection. 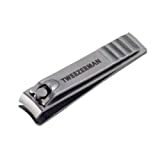 Most of the individuals who have bought the Tweezerman Stainless Steel Fingernail Clipper feel satisfied with their purchase, when we looked on Amazon, we saw that more than 130 individuals reviewed our bronze pick. Over 50 percent gave it a perfect five out of five-star rating. Some of the things that individuals who rated the product liked about these fingernail clippers are that they are sturdy, sharp, and inexpensive. They say that even though they have used them for quite a long time, they do not get dull. Most individuals agree that they do what they are supposed to, clip fingernails in a precise way. One person who left a review on Amazon said that they usually trim their fingernails when they are in the shower. They liked the Tweezerman Stainless Steel Fingernail Clipper because they never rust. They say that they have owned other pairs of fingernail clippers in the past that they used in the shower, but after a while, they became rusty. They even left rust stains on surfaces in the shower. So far, they have had no problems with this product and would recommend it to others. One of the complaints that individuals have made about this model is that they feel that they are too small if you have large fingers. One man said that they were just too tiny to trim his nails and was not able to get good leverage. However, he said that they made a good clean cut. Other individuals just gave it an average rating, saying that they were not much better than something they could buy at a local drugstore. Our budget product is going to give you a precise cut, but you are not going to need to fork over tons of money in order to pay for the product. It is a product that balances quality with affordability. One of the great things about the Trim Easy Hole Fingernail Clipper is that it has a rubberized grip that allows you to have maximum control over the fingernail clippers as you cut your fingernails or toenails. You will not be worried about slipping if you are cutting a fingernail that is slightly sensitive because of an ingrown nail. Or if you are trimming your kid’s fingernails, you do not have to worry about accidentally cutting their skin or cutting too far into the nail. The TTrim Easy Hole Fingernail Clipper catches fi fingernail clippings as they are trimmed from fingers and toes. This means that you do not have to clean the area under where you were trimming your fingernails after the job is done. And you definitely do not have to worry about stepping on thick nails because you were not able to get them all up after cleaning. It catches the nails, and you can dump them in a wastebasket or dispose of them in another way quickly and easily. Our budget product comes in a variety of colors. When you order the Trim Easy Hole Fingernail Clipper, you will receive a random color. It is not possible to select the color you want. It is great to have in your home whenever you do your fingernails or trim your kid’s fingernails. Or it can be used in a professional setting in a salon in order to do manicures and pedicures. Individuals who have used this Trim Easy Hole Fingernail Clipper have shared their thoughts about it on Amazon. They have given the product an overall 3.9 out of five-star rating. Many of the individuals who have reviewed this product said that they are the right fingernail clippers they have ever purchased. They say that they do not flip out of your hand and allow you to give a precise cut. They also say that they are good for elderly individuals or individuals who have arthritis. There are a couple of people who were not completely satisfied with their purchase. They bought the clippers brand-new but said that they were too dull and were not able to trim off a hangnail. We feel that for its price, the Trim Easy Hole Fingernail Clipper is a great option for individuals who would like to add a new pair of fingernail clippers to their other personal care items. The purpose of fingernail clippers is to cut your nails. If they become dull, instead of trimming your fingernails, they are going to leave you with nails that are jagged. In worst case scenarios, dull fingernail clippers will actually crack your nails. Fingernail clippers that are made from stainless steel are awesome because they never get dull. Since stainless steel resists oxidation, you can continue to use them over and over again. Even if they get wet, you’ll get as good of a cut the first time as you do the last time you use them. If you are purchasing fingernail clippers from a brick and mortar store, one of the first things you should test is the pushdown bar. This is where you put your thumb as you are operating the fingernail clippers. It should never seem like your thumb is going to slip off of the pushdown bar. And you definitely should not feel like you are getting a mini workout as you are operating the device. The best push down bars are those that are a quarter of an inch wide or wider. Before you purchase fingernail clippers, look at how the blade is shaped. Many people think that since the human nail is curved the best blades are curved blades. But that’s not necessarily the case. A straight blade can work even better as long as you are using the proper nail cutting technique. When you cut your fingernails, you don’t want to cut one big piece off. The idea is to cut your nails in three smaller cuts. If you use this method, a straight blade is a lot safer than a curved one. This is because curved ones can actually nick the hyponychium. Most higher end fingernail clippers come with a carrying case. This case is nice because it keeps your device cleaner and hygienic. It also allows you to carry around them with you wherever you go and maintain a professional appearance. As we have discussed multiple times in this review, you do not want to buy cheap fingernail clippers. The best nail clippers are not made from nickel plate. These are the ones that you purchase at the dollar store. They are guaranteed to fall apart in just a few days. 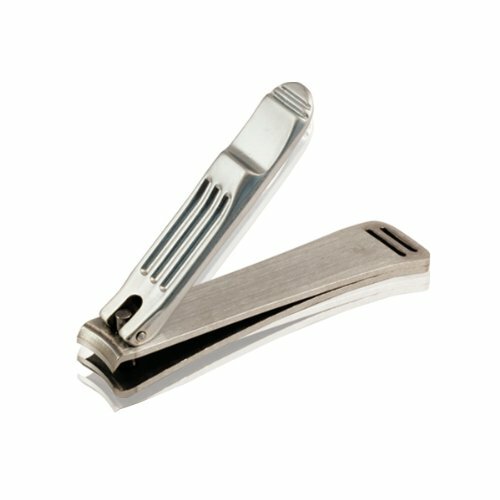 Quality fingernail clippers are made from stainless steel. They offer precise trimming and can handle the thickest finger or toenails. In addition to keeping our fingernails looking nice, trimming them is hygienic. We use our fingers for just about everything we do throughout the day, including eating food, cleaning things, and picking things up off the ground. If bacteria is allowed to build up underneath our nails, this could find its way into our body and cause us to get sick. The products that we have reviewed are designed to help you keep your fingernails trimmed in the easiest possible way. We hope our review gives you some food for thought that you can use as you shop for the top fingernail clippers.